How to Perform Recovery Storage Group in Exchange Server? Recovery Storage Group (RSG) is an administrative feature introduced with Exchange Server 2003 SP1 that allows easy restoration of user mailboxes without any need for a whole pile of work. Earlier, you were required to configure a separate forest (known as Alternative Forest Recovery) with an Exchange recovery server. After restoring to the server, you could easily export all mailbox data to a PST and import the PST into your production mailbox. With the recovery storage group feature option, it is possible to mount a second copy of your database on the same or another server in the same Exchange administrative group. This operation can take place at the time when the original database is still running. This ensures full-time Exchange database availability to the end users. You can restore a single mailbox, multiple mailboxes, or the entire database to the production server. The above operation is complex and requires abundant knowledge and expertise to accomplish Exchange sever recovery. Moreover, if you do not have administrative rights to create and manage RSGs, you cannot use the recovery storage group feature. 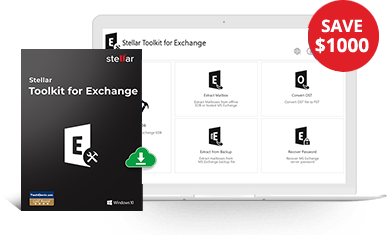 In such situations, Stellar Repair for Exchange provides an easy and reliable means to recover inaccessible user mailboxes. The Exchange Server Recovery Tool is a competent tool proficient in repairing corrupt exchange server databases and restoring precious user mailboxes without losing data integrity or affecting mailbox configuration. The software can safely restore all your mailbox items, including emails, contacts, tasks, appointments, journals, calendars, etc. Furthermore, the tool supports recovery of MS Exchange 5.5, 2000, 2003, 2007, 2010, 2013 and 2016, 2019 databases and is compatible with Windows 10, 8, Windows 7, Vista, Windows Server 2012, and 2008.